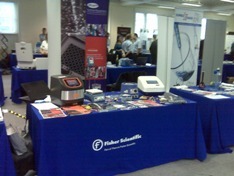 Bibby Scientific attends the Fisher Activate Science Event! Bibby Scientific took part in the Activate Science road show at Cambridge University on 9th November. The show gave Bibby Scientific the opportunity to showcase all the latest innovations from Jenway, Stuart and Techne. The exhibition gave customers the opportunity to have hands on demonstrations of the new hotplate stirrer range from Stuart, which was launched in September. Also available on the Bibby Scientific stand was Jenway's newest spectrophotometer range - the 73 series, which uses innovative icon driven software; and Techne's TC-PLUS thermal cycler, which has a colour touchscreen and a non-motorised heated lid. The Activate Science road show is continuing until the end of the year in preparation for Fisher Science World 2012 which is being held at Wembley Arena! For more information on the NEW Stuart Hotplate range click here. For more information on the Techne TC-PLUS range click here. For more information on the Jenway 73 series spectrophotometer range click here.